The story behind this concert starts at the end of April when the live was first announced. Tickets were released in early May with priority to the people who went to Download Festival and due to the limited amount (around 1100 I think) they were sold out before being made available to the general public. Resellers were selling them around £63, so what I did is I took my £20 voucher from the local casino, played blackjack for 2 hours, made £64 and bought a ticket! I arrived at the venue nearly 2 hours before the doors opened and there were around 100 people waiting outside. By the time the doors opened, I estimate that there were about 300-350 people in line. We got in and waited for the opening band to play, Sanguine. They were truly horrible, one of the worst bands I have ever seen. 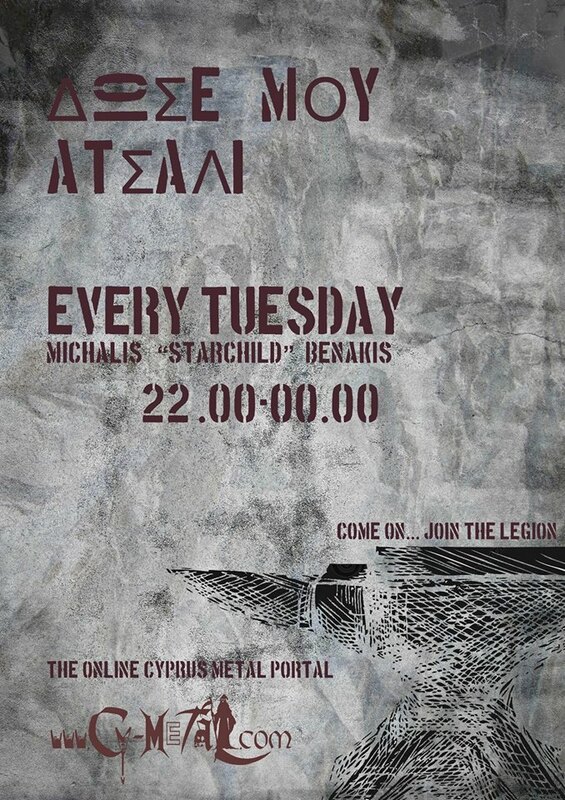 They play a mixture of punk/Lacuna Coil/Hatebreed metal with awful vocals and boring performance. I wonder why they chose them for supporting Megadeth. 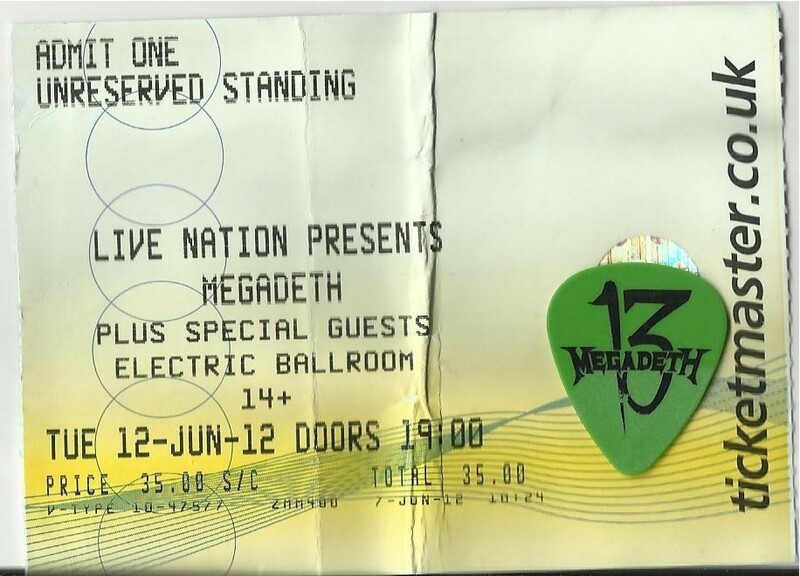 Megadeth got up on stage around 9 o’clock and played for one and a half hours. Their show was really professional and the crowd was insane. 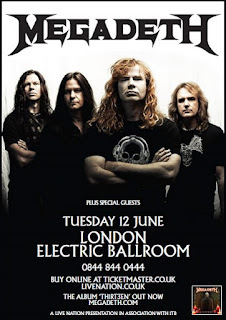 Mustaine, Broderick and Ellefson were flawless on guitars and bass, and Shawn Drover just did his job behind the drums. I was really impressed with the sound of the venue which was surprisingly good. Mustaine’s voice was weak but there’s not really much expectations of him after all these years and the surgeries he went through. The crowd sang with him throughout the whole concert and it was amazing, specifically during ‘Sweating Bullets’ when Dave just turned the microphone towards us. They played 17 songs, 4 of which are from their latest album ‘13’. ‘Foreclosure of a dream’ was somehow an unexpected surprise. The only thing I am really disappointed about is that they didn’t play any song from ‘So Far, So Good…So What’ not even ‘In My Darkest Hour’ or ‘Hook In Mouth’ which are normally played in every show. 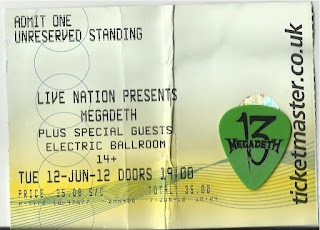 I left the venue one hour before midnight with every bit of my body aching, and with Dave Ellefson’s pick which I caught after ‘Holy Wars’ was played. 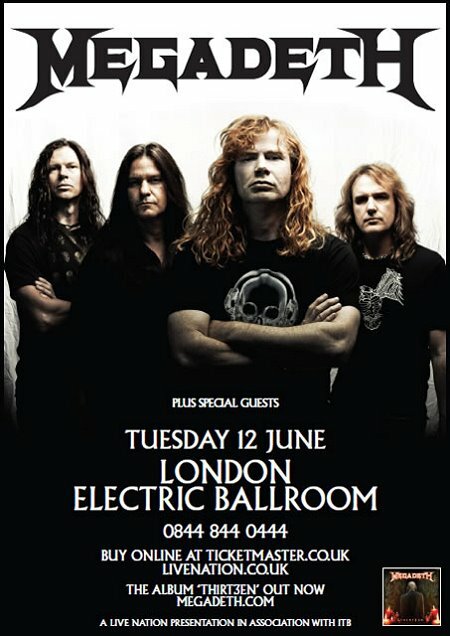 Megadeth’s live in London was excellent and I would definitely see them again anytime.